Packing for Walt Disney World can be a daunting task. When getting ready for the big trip, most people start to realize that this sort of vacation is more involved than most trips. Actually, I take that back... after their first trip to Disney, most people realize all the items they should have packed and didn't! Being in the Parks all day, usually without heading back to the resort, makes you wish you had certain things. You start dreaming of extra bandaids, random medications (oh the desire for pain meds can be strong! ), more sunscreen, backup sunglasses, baby wipes, a pocket poncho, an extra iPhone battery charger (may I recommend the $20 Energizer external battery? ), and other various items. I have very specific items I keep in my "Park Bag" that I don't typically carry around Texas. While these small items can make long days in the Parks more comfortable, I have begun to focus on other items that make the resort more livable for when I share my room with a friend or my family. Over the years of trips, I've compiled some items that I will not leave for Walt Disney World without. I detailed my Disney Bag of Tricks when I was getting ready for my December 2011 Trip, but I'm going to share just one of my favorites with you in this post. How many of you have bathroom counter that looks like mine? That is ALL my stuff! I don't have anyone to share the space with, and that is fine by me! 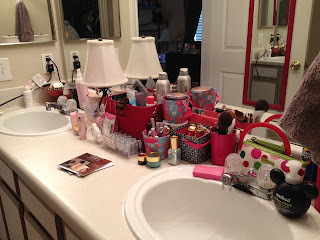 I love make up and hair products! 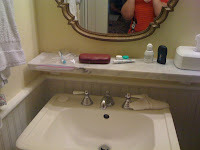 When I "bunk" at Walt Disney World with my niece and nephew, they mostly keep their few items of bathroom stuff in their parents bathroom, so I don't have to worry much about space. 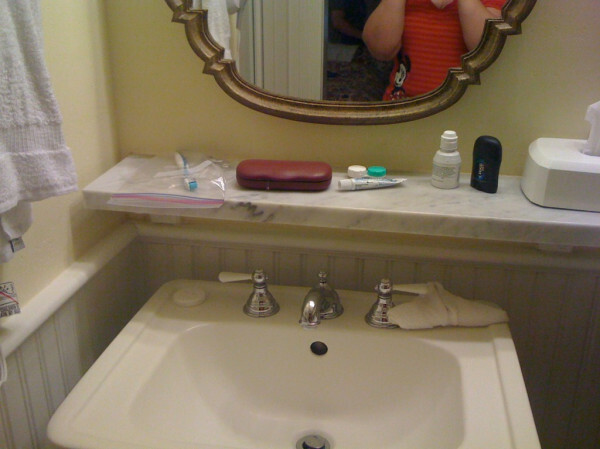 When I travel with Kyle though, I need to be careful to not encroach upon his space on the tiny bathroom counter in the resort room. That's where these bargain beauties come in to play! Bins like these are always available for $1 each in the dollar section at Target. They are made of sturdy cardboard, come in various sizes and shapes, and they usually change the designs for the seasons. I scored some Christmas designs for our Christmas trip! 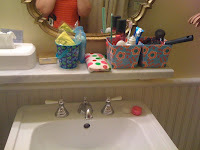 If you look at the picture of my bathroom counter, you can see that I use these types of bins in my bathroom at home. They're perfect for holding eyeshadows and makeup brushes and other items that usually lay on the counter and look messy. The best part about these bins are that they're cheap, so if they get wet or messy in the bathroom, you can toss them and get new ones later! I always take 3-4 of these bins with me to Walt Disney World. Since they stack, I set them in the bottom of my carry on bag on the way to Disney to hold items like my trader Vinylmations that need a container. On the way home, I either toss the bins to make more room for souvenirs OR I use them to help transport breakables. They are so sturdy that you can put a tissue wrapped statuette or glass ornament into one and carry it home without worrying about it breaking or getting crushed. Here's Kyle's side in June 2011. See how nicely those work? I can't do without these bins now! I hate feeling like my resort room is messy with items laying all over the tables and counters. This makes things neat and clean. Besides, a small room that's organized feels less claustrophobic to me! So how about you? What are your items you won't leave for Walt Disney World without? Seriously, SO ADORABLE! I love these ideas! What a great idea!!! I'm with you, a messy hotel room makes me crazy. These definitely go at the top of my "must-pack" list! That is such a great tip! I going to put that on my list of things to get for our next trip. The Adventures of Kyle and Joanna (Part II)!!! WDW Trip Report - Day 5 - Oh D-d-d-dear!